We are not currently accepting applications. Please contact the Graduate Admissions office for more information. Become an environmentally conscious, management-savvy social innovator. In an era marked by profound social, economic, and environmental change, how do leaders, citizens, and decision makers navigate policy and business challenges? What kinds of knowledge and skills do the professionals of tomorrow need? The MBA/M.S. in Environmental Science and Policy dual-degree program at Clark University educates students to become environmental professionals prepared to make a difference in this complex global landscape. Pairing an MBA with a M.S. in Environmental Science and Policy is a potent combination, joining two different and essential sets of skills and sensibilities. Our students gain deep scientific knowledge, as well as technical and analytical skills – in combination with business, management, and finance capabilities. They work on exciting collaborations among businesses, nonprofits, communities, policymakers, and researchers. They focus on vital topics such as environmental science, environmental law, sustainable production and development, urban ecology, negotiation and mediation, and quantitative modeling. During and after their time at Clark, our students discover how to turn the challenges they encounter into opportunities for integrative, collaborative, sustainable enterprises, both in the U.S. and internationally. Why an MBA/Master’s in Environmental Science and Policy at Clark University? Combine scientific knowledge (e.g. of climate change) and technical skills (such as GIS) with business and management acumen – a rare and much desired combination among employers. Join both our AACSB-accredited Graduate School of Management and our renowned International Development, Community, and Environment department. Explore our ten transdisciplinary concentrations, which provide both breadth and depth in understanding issues and developing responses to them. From her homeland in West Africa to the U.S., Claire Doualla wants to use her combined master’s degree in business administration and environmental science and policy to find solutions to address poverty. You can’t save the world by yourself, but you can bring your fair share to the table. You can contribute by finding solutions to problems one day at a time. The MBA/M.S. in Environmental Science and Policy program allows you to earn two degrees in three years. Students complete the core requirements and electives for both academic programs. Our curriculum instills a comprehensive understanding of the complexities of environmental science and policy, as well as the management skills to lead successful projects and teams. You’ll combine theory and practice through intensive practicum courses, small seminar-style courses, internships, a Capstone project, and by working closely with business leaders and community groups. Because some courses can overlap and count for both the M.S. and MBA degree, dual-degree students complete fewer elective courses than regular MBA students. Required coursework will provide you with an MBA concentration in Social Change; a dual concentration is optional, but would require 2-3 additional units of MBA elective coursework. You can also expand your horizons by taking courses from other programs or schools at Clark, where you will form connections with peers of diverse academic interests and perspectives. ere you will form connections with peers of diverse academic interests and perspectives. Examine and challenge conventional ideas, policies, technologies, and practices, such as U.S. energy policy or the U.N. sustainable development goals. Apply knowledge and methods from the natural, social, and management sciences, including the ability to gather, analyze, and interpret diverse data: quantitative, qualitative, spatial (GIS), and ethnographic/narrative. Forge collaborations among businesses, governmental agencies, NGOs, researchers, donors, and communities for a more sustainable, climate-resilient future. Develop a systems-based understanding of an issue, as well as the creativity to envision and implement solutions with a team-oriented approach. Communicate effectively to lead change in diverse domestic and international settings, and within social, political, cultural, economic, and ecological contexts. All dual degree students complete the MBA Social Change and Sustainability concentration. A second MBA concentration may be added with 2 additional units for the MBA. Your full immersion in both the M.S. 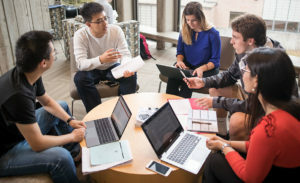 ES&P and MBA programs allows you to explore diverse perspectives on how to effect change, enabling you to break down the traditional boundaries between the private, public, and nonprofit realms. You’ll connect with faculty and students who share a passion for sustainability, social justice, and socioeconomic well-being. Together, you’ll engage in projects that build upon our established partnerships with community groups and organizations. At Clark, you’ll join researchers, business leaders, and professionals from many different countries who share a commitment to local and global change through integrative, collaborative work. The people you meet will not only become valuable professional contacts, but also friends and supporters with whom you will maintain lifelong connections. Take our popular Global Business Seminar course, which combines class work at Clark with a week of visiting international firms. Join Net Impact, an organization for students interested in promoting socially and environmentally responsible practices. 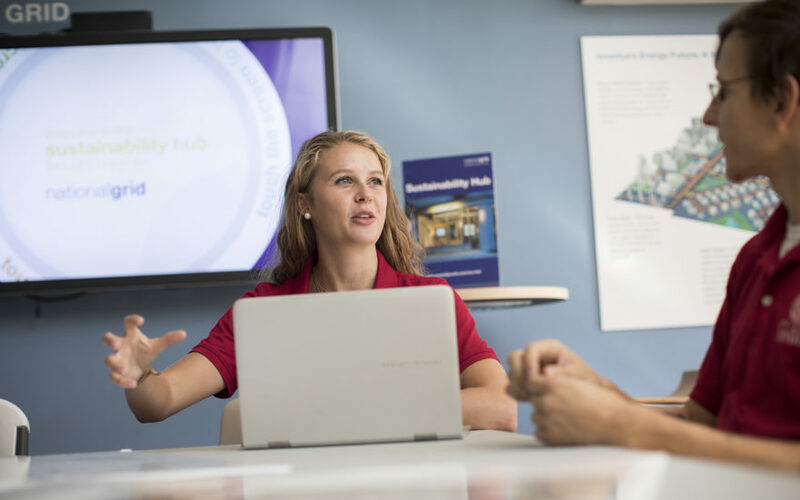 Make an immediate impact through your Sustainability Consulting Projects course, which enables you to identify a client anywhere in the world for which you may create a community development plan, new enterprise plan, or sustainability action plan. Participate in on-campus guest speaker series and panel discussions with experts and leaders from organizations around the world. Take advantage of events in Boston and Worcester, including the Harvard Women in Business Conference, United Nations Day Luncheon, and Northeast Organic Farming Association Winter Conference. How can we create a more sustainable, climate-resilient future for Puerto Rico? How can we increase the sustainability and climate resilience of Central Massachusetts’s economy? What kinds of products and services are needed to support new energy systems, food systems, health promotion and care systems, water supply and sanitation systems – and how can they be designed in more integrative ways? Developing customized sustainability plans for a myriad of American entities including: small businesses, non-profits, houses of worship, schools, towns, hospitals, etc. Organizations increasingly need entrepreneurial managers who grasp the complexities of environmental science and policy. Our graduates design innovative services that create a more sustainable world. They work in environmental consulting firms, international development companies, corporate social responsibility offices, sustainable technology businesses, government agencies, and nonprofit groups. Professor Ruelle studies food sovereignty through a biocultural lens and climate change adaptation in indigenous communities. He works on knowledge partnerships and adaptive strategies in the U.S. and Ethiopia. Professor Gilmore's research interests include the economic and societal impacts of climate change and low-carbon energy technologies. She works on U.S. and global-scale climate action programs. Professor Downs studies how humans change the environment, and how those changes impact the ecosystems they inhabit. He also facilitates sustainable development in New England, Mexico, and Puerto Rico. Professor Zhang dedicates her research to examining management information systems, including interorganizational knowledge sharing and networking. Professor O'Brien is an experienced executive, entrepreneur, consultant, teacher, and attorney. His research interests include business sustainability and environmental stewardship. Tom is a consultant to global companies, helping improve business plans and investments across global markets. He designed the unique "Sustainability Marketing" course for GSOM. Frank has more than 25 years experience as a managing partner for a strategy consulting firm. He teaches courses related to financial management, mergers and acquisitions, and corporate finance. Professor Graves studies work-life balance, how organizations encourage diversity, and how business leaders engage with socially responsible activities. Professor Gallo teaches courses related to business policy, international management, and real estate; her research focuses on effective decision-making and business strategy. Professor Dobson studies how home-based entrepreneurs use information systems to improve livelihoods and incomes, including the impact of entrepreneurial education and social networks on small-business performance. Professor Coulter studies consumer behavior and marketing strategies to determine how and why we’re persuaded to make purchases. How does social change intersect with education, corporate citizenship, university-community partnerships, and the arts – and how can organizations manage effectively in a constantly shifting marketplace?